Back in the days when GM, Chrysler and Ford were appending giant tailfins to their cars, and manufacturers around the world couldn’t decide which way the doors should open, Fiat released the 1100 into the marketplace. If you’ll recall, the 1950s and 1960s produced cars with suicide doors in the front, suicide doors in the back, gullwing doors, sliding doors, and no doors at all. Lancia’s Appia even had no b-pillar and rear suicide doors to aid access. Interestingly, there was no car with suicide doors front and rear. 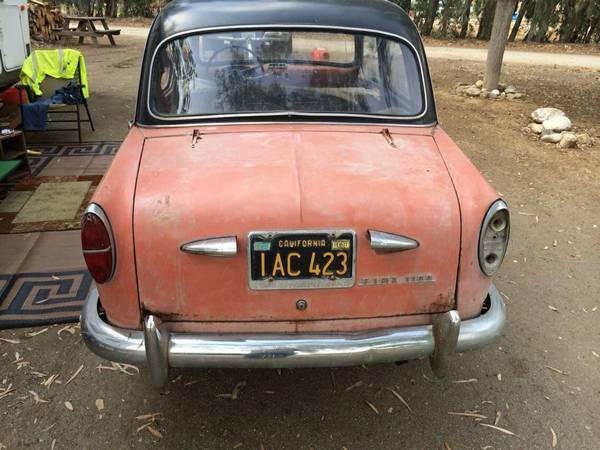 Check out this 1958 Fiat 1100 for sale for $2800 in Sanger, CA. Much like today’s Mehari, there is not much remaining of the original red color. The body also looks to be in good shape, aside from a little rust in the bottom corners of the trunk lid, and a hood that may be crooked – the seller seems to have propped it open to run what is likely a fuel line from a jerry can in the passenger compartment to the engine compartment. All in all, though, this looks to be a fairly solid car needing cosmetic refinishing. 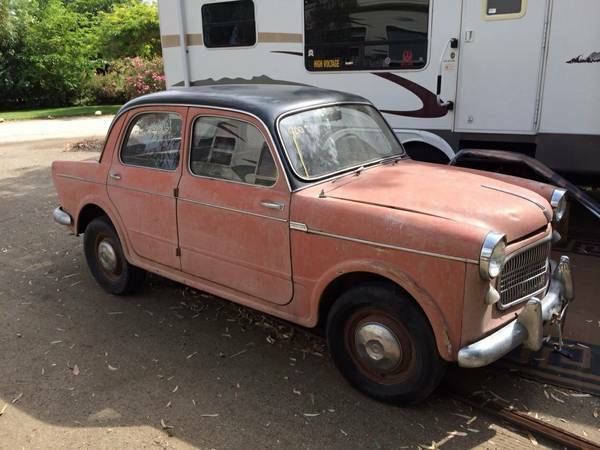 The seller has got the car running, painted the wheels white and fitted new whitewall tires. Black on red is a smart color combination, and gives the car a more formal look. All trim looks to be present, although the hubcaps might need straightening or repair – perhaps a paintless dent removal shop could do something with these. There’s something very charming about the rear view of this car. Perhaps it’s because the black painted roof kind of looks like a bowler hat, or the two tail lights framing the black license plate and the Fiat 1100 script. Who would have bought this car in 1958? Post-war European immigrants? Someone affected by the recession of that year? Would they have cross-shopped Renault Dauphines and VW Beetles? Not much indication is given of the condition of the interior or engine, but if those are good, this could be a good deal. 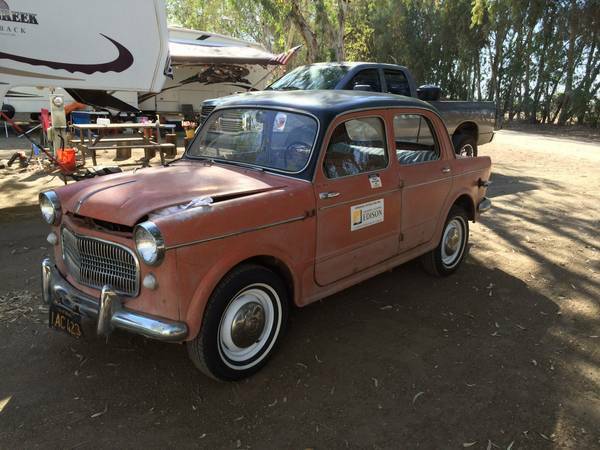 If not, negotiate down a little and then do a budget rolling refresh of this charming little car. This entry was posted on June 10, 2014 at 3:31 pm and is filed under Feature. You can follow any responses to this entry through the RSS 2.0 feed. You can leave a response, or trackback from your own site.